Simply put - this is Elton! Scotsman Rus Anderson is Elton John's official body double for his ‘Farewell Yellow Brick Road' world tour media campaign, set to kick off in September 2018. Hand picked by Elton John & David Furnish, it was Rus' own live tribute production ‘The Rocket Man Show' which got him noticed. Rus' painstaking attention to detail includes wearing gorgeous, colorful & spectacular costumes (many actually worn by Elton) including his iconic boots, glasses & jumpsuits from 1973, as well as a sparkly Swarovski tuxedo from 1984. 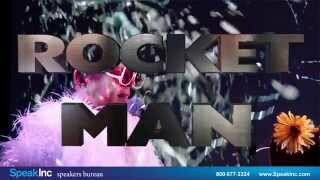 The Rocket Man Show is a regular feature across the USA at venues such as House of Blues, Hard Rock Live, Caesar's, Harrah's, Legends In Concert, BB King's, Universal Studios & Walt Disney World. You cannot go wrong with this much experience onstage at your venue. Rus & his full band of merry crackerjack musicians are the very best in the business. The show is 100% live in both vocals & instrumentation. Absolutely no tracks or lip-syncing. The performance itself is an extremely sincere, intense & visual spectacle of a journey. There are ballads & driving rock songs. Audiences laugh, cry, sing & dance as they recall the highs & lows of Elton's epic career. In summary, the key to success when hiring a band - or even buying a ticket to go & see a band - is knowing how professional they'll look, act & perform when they arrive. Rus Anderson has been officially hired by Elton John himself to re-enact the most memorable moments of his career. How's that for peace of mind? With hundreds & hundreds of shows & satisfied clients, thousands upon thousands of dollars in costumes & a 5-star rating on many of the USA's elite talent rating platforms, Rus is an ASCAP member, Disney verified & fully licensed & insured.